Shawn, In the learning 3 presentation you cited a reference to the Yom Teruah opinion of Yacob ben Reuben stating there are two answers to the reasons for it to be a shouting rejoice on this day and not a blowing of horns. (see youtube 28:35 for reference). That it is for ALL to rejoice on this day, including the clean and the unclean. Please expand your understanding on what is inferred here by all, both “clean” and “unclean”. and, could you please post this on the blog so all can read this reply to this question. 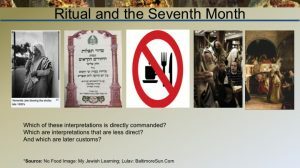 Only pure people could enter the Temple, so the fact that this holiday is everywhere and in every city means that even the impure can participate in this commandment – and it is an important commandment given its proximity to Yom Kippur.